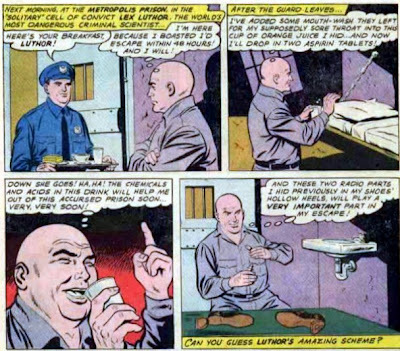 Can you guess Luthor's amazing scheme? Oh well now how was I supposed to guess that?! Also: hey kids! Wanna be invisible?! Just sink a cup of mouthwash, orange juice and a couple of aspirins and then stick radio parts in your shoes! Science! How many kids died trying this? Panels are taken from Action Comics #286.